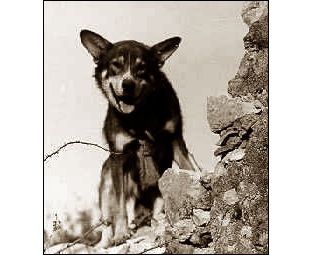 The top dog for publicity in the U.S. K-9 Corps was ‘Chips’, a shepherd-collie-husky mix. Chips started out as a guard dog at the Roosevelt-Churchill conference at Casablanca. He then saw action during the invasion of Sicily, where he broke away from his handler and routed the enemy out of a machine-gun nest (they were captured, and I’ll bet they had a story to tell!). On the same day, Chips also helped capture another 10 enemy soldiers. He was one brave and busy dog. As a result of his valor under combat, Chips reportedly received three medals – a Silver Star, a Distinguished Service Cross and a Purple Heart. It was the latter that was most controversial, and there are various accounts of what happened next – that the Purple Heart was ultimately taken away from him, that he got it back, or that he never lost it in the first place…The official record is a confused at this point. Later in the war, Chips was personally congratulated by Gen. Eisenhower for his heroics on the battlefield. But, as Ike bent down to pet him, Chips bit him – just as he was taught to do with any stranger! Read more in ‘Honoring the Only Dog to be Awarded the Purple Heart’, on Scott Bomboy’s blog.